This powerful collection is divided into two parts. The first part focuses on childhood, coming of age or, as it often seems, waiting to come of age, to “rise at last from the state of useless, unfinished, in-between beings”. Set in the years immediately following the Second World War, the town is a place where men are in short supply. The majority of the children are fatherless, their mothers widowed, and few babies are born. Consequently, relationships and social dynamics are skewed. In the opening story, “The Place of Storms”, the young narrator endeavours to negotiate the murky waters between the realm of the “little children” and that of the “older children”. Rumours that his grandfather has a gun boost his status and potential for crossing the divide, while the horrific swim trunks his mother knits him complete with suspenders are a decided barrier. All of the awkward anxiety of youth is played out in the grimy pools of the abandoned mine pits at the end of the street where children wile away the summer hours divorced from the world of the suffering, lamenting adults in their lives. The stories in the second part are set in the 1990’s, after the Wall has come down. The protagonists are all now grown men, writers, who have long since moved away from this small town, but find that they are unable to stay away. Restless, they regularly return to encounter ghosts, to visit an aging mother, or to escape a disintegrating relationship. No matter how long they may have been away, they never really leave the place behind. But they return to a town that is dying, industries and businesses that have been abandoned, and memories that cannot be escaped. In the final, and longest story, “The Dark Man”, the unnamed narrator is an established author who encounters, on the darkened streets of his old hometown, a stranger who has pursed him and now reveals that he was the Stasi agent responsible for intercepting and reading the writer’s correspondence. He claims to have a collection of letters originally intended for our hero’s former lover, a woman who presently lies near death. The narrator is disturbed, but determined not to let this curious relic of the GDR get the better of him – he denies any suggestion that he and his enemy have anything in common. Yet when he gets back to his mother’s apartment, the man in the bathroom mirror bears a haunting resemblance to what he could manage to make out of the stranger in the dark. Night after night, grandfather and grandson twist and turn to a nocturnal chorus of queries and accusations, in this poetic evocation of the tensions that underlie the fictions that families maintain to make sense of the very ordinary tragedies that strike close to home. In his introduction to this volume, Hungarian writer László Krasznahorkai, writes that in focusing on the mundane, the everyday life in East Germany, Hilbig manages to heighten the oppressiveness of that existence, rendering it all the more horrific as a consequence: “He wrote his astounding novels about a world in which only the weak, the sensitive, those incapable of bargaining and in no way heroic, can sense the chaos and the surrealism.” However, the measured, heavily weighted quality that hangs over the stories in The Sleep of the Righteousness, is bouyed by the sheer beauty of the prose and the quiet resilience with which the protagonists respond to the circumstances that history has gifted them. This could be a depressing read but somehow it is not. Translator Isabel Fargo Cole, in a recent interview in World Literature Today, indicates that this collection is one of Hilbig’s most autobiographical works. His narrators tend to share the same basic features of his background – his grandfather emigrated from Poland, his father disappeared at Stalingrad, and he grew up with his mother in a household dominated by women. The town he mythologizes in his tales is modeled after the same one where he was born and grew up. Yet, it does not feel liked these are connected as part of a continuous narrative so much as each protagonist seems to have a similar launching point from which he proceeds to tell his story. There are overlaps and divergences along the way. 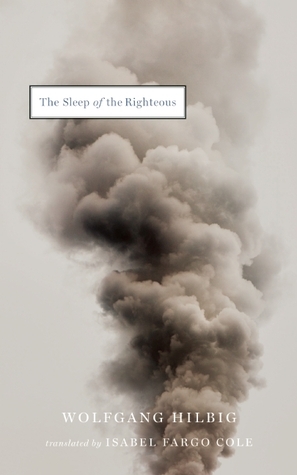 The Sleep of the Righteous is published by Two Lines Press. Along with his earlier novel, I, which was also translated by Isabel Fargo Cole and released by Seagull Books this summer, English speaking readers finally have a chance to experience the sombre magic of Wolfgang Hilbig. And, hopefully, look forward to more. Wonderful review. This is a book and author I hadn’t heard of, but it sounds very powerful – thanks! This was a book I had been contemplating reading. It’s now firmly on my TBR list. It is haunting and quite wonderful. I had a more positive view of Leipzig: the university was well respected, it had one of the oldest book fairs in Europe, well known for its literary links etc. etc., but I suppose the small industrial towns around it must be very dull and lifeless in comparison. A bit like the dying town in ‘Neck of the Giraffe’, I should imagine. A writer I shall be looking up – thank you for drawing my attention to it. Hilbig was born (1941) in a town called Meuselwitz and the translator herself says it is much prettier than he makes it out to be. But it stands in his literature as a mythologized town and landscape, based on a real place/time, just as his characters tend to share features of his own life. However his writing spins into a somewhat surreal, noir space of its own. That is what makes it so fascinating… that line is crossed so hypnotically. This collection is one of his later works (he died in 2007). I also have his only other translated work to date “I”, his second novel and I am looking forward to reading that. Excellent review of a brilliant author. I have read almost everything by him and cannot stop re-reading his powerful prose. His prose is wonderful, I found myself re-reading passages over and over for the sheer hypnotic power. A book I was already considering getting and, as usual, your excellent review has pushed me closer to that point! I’m so glad small presses are making such authors available in translation. Yes. I wonder how much the translator’s interest in his work stimulated the two releases this year as they both come from independent presses. I’d never heard of this … but now I really want to read it! Thank you for such a great review and for once again letting me know of another wonderful book that’s out there, just waiting for me. Thank you. This is one of the few books that I have ever pre-ordered before the release date just to be sure I would have it. And I was not disappointed. I don’t know why I haven’t read him yet, he sounds excellent. And I’m glad he was translated. Maybe it’s a bit too bleak for me at te moment but at a later date, I’d be tempted to pick him up. It is not as bleak as it sounds, moody though. His writing has a remarkably cinematic feel. Thank you for the wonderful and insightful review! And it’s great to see so many comments. It took me a long time to find publishers for Hilbig’s work, and it’s exciting to see the response he’s getting now, and discussions like this one here. I’m really grateful to both Two Lines and Seagull Books for taking him on – he is a dark and difficult but extremely rewarding writer. Truly a unique figure. Thank you so much for your comments. I have Hilbig’s I and am looking forward to it. The Hoffer looks fantastic. It sounds like something i would not only like to read but to review in a more in depth critical context. I tossed off the idea to he editor of a journal I contribute to. I read an interview with you and am really intrigued by the writers you are drawn to. I recently obtained your translation of Boys & Murders by Hermann Unger. Thanks again for stopping by.